It has been exactly 17 years now. 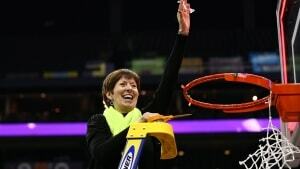 University of Notre Dame women’s basketball coach Muffet McGraw has pushed the events of that day as far into the corner of her memory bank as she can. She still doesn’t really want to talk about it. And she assuredly can’t shake the emotions she felt then and still feels today. On the fateful morning of Sept. 11, 2001, McGraw originally had been slated to fly from Boston to Los Angeles on United Flight 175. She was headed to visit eventual Irish commitment Courtney LaVere. But several days earlier Notre Dame assistant coach — now Ohio State head coach — Kevin McGuff convinced her to change her plans and instead fly with him out of Providence. He was headed back to South Bend on a Delta flight via Detroit. So she switched her flight to join McGuff. On that Tuesday morning, United Flight 175 was the second plane to crash into the World Trade Center, the south tower, in New York at 9:03 a.m. The 65 people on board the huge Boeing 767 died, along with more than 2,500 others that day in lower Manhattan. At the Pentagon, 125 were killed and 40 more died in Shanksville, Pennsylvania. During the attacks on Sept. 11, 2,996 people lost their lives and more than 6,000 were injured. McGraw never wanted to speak about her experience. Now, for the first time, she haltingly and emotionally offers her thoughts on what happened over those days. McGraw and McGuff had flown commercially to Boston on Monday to make a home visit that night in the recruitment of Nicole Wolff, a guard from Walpole, Massachusetts. Wolff, the 2002 McDonald’s High School Player of the Year, eventually enrolled at Connecticut. McGraw was slated to fly home Tuesday morning and —with the two of them sharing a rental car — McGuff talked McGraw into passing on her nonstop flight to the West Coast to instead join him on the first Delta leg out of Providence to Detroit. She’s still not sure why she agreed. McGraw’s husband Matt recalls being in the kitchen and listening to that conversation between McGuff and his wife. “I was thinking to myself, “He (McGuff) is going to lose this bet because she never buckles on things like this,” he says. But she did, and so McGraw and McGuff boarded the plane in Providence Tuesday morning. “We got off . . . and we saw the second plane hit on TV . . . right there. “And then we ran into (Irish men’s basketball coach) Mike Brey. We didn’t even know he was there. “It was a beautiful day in the Northeast, but yet they put ‘Delayed’ up for our flight out of Providence. “And I’ll never forget this – the guy at the desk obviously was clued in. You would have thought he saw a ghost. “I sat around another 10 minutes and still didn’t know what had happened. Then I walked upstairs into the main lobby and everyone is around the TVs watching. I walk a little further and it’s Muffet and Kevin McGuff. The three listened to developments on the car radio throughout the drive back to South Bend. “I just stayed in the back seat. We tried to avoid conversation about it,” McGraw says. Even more emotional was McGraw’s communication with Matt. He was at Notre Dame’s Warren Golf Course that Tuesday morning – but he believed his wife was still scheduled on the United flight out of Boston. “That was the hardest,” she says, her voice quietly trailing off. “Apparently someone at the course talked about what had happened to the flight from Boston to LA – and he thought I was on it. “When I talked to him he was so relieved. I told him I was coming home. Matt recalls stopping in the clubhouse after playing part of his round. “Everybody was looking at the television, and I said, ‘What are you looking at?’ And they said a plane had just hit the twin towers. I thought it was just one of those small-engine planes. “So now I’m in a panic. I walk out of the clubhouse and I dial her number and it rings and rings. But I knew that sometimes she changes flights in a second. “I think for all of us, it’s like a part of you died that day that hasn’t come back. “Frightening would be the simplest way to say it. “Was she on that flight? There may be no way to describe the terror Matt felt when he thought Muffet was on that plane. Adds Brey, “And the night before couldn’t have been better for us. It was me, Anthony Solomon and Torin Francis’ prep school coach sitting on a deck, having a beverage, because Torin had committed and he was going to make his official visit that next weekend. Of course we had to scratch that because all the flights were cancelled. By the next day, plenty of people had heard about McGraw’s circumstances. She doesn’t recall hearing much from her players once she returned to campus. That decision to switch fights goes down as more impactful than any she has made on the basketball sideline. There were a handful of memorials and other ceremonies to denote the 9/11 events – but McGraw could not bring herself to participate. She never visited Ground Zero. “I couldn’t do it. It was enough seeing it on TV,” she says. But a year ago she visited the new National September 11 Memorial and Museum on Greenwich Street in Manhattan. When she did, she didn’t quite know what to think or how to react. “It was a little emotional. But I also didn’t know anyone who was actually in either of the buildings,” she says. It was hard for McGraw – or anyone else alive that day – to compare those events to anything else. McGraw believes good things come in threes. In 2001 that triumvirate was the Irish national championship, a summer hole-in-one on the golf course — and then the September decision to change her flight. In 2018 McGraw and her Irish already have achieved another NCAA title. She’s waiting for the next hole-in-one.